As part of the (very late) review of the international postcard exchange that Playing by the Book organised for over 1000 families, we decided to get some books relating to “post”. We got four in total – our favourite will be reviewed in our story + art post on Wednesday (next post). Here are the other three. Kisses from Rosa, Petra Mathers. This is a very moving and autobiographical book by Petra Mathers – after the war her mother frequently went away for tuberculosis treatment. It was a very sad time for her. 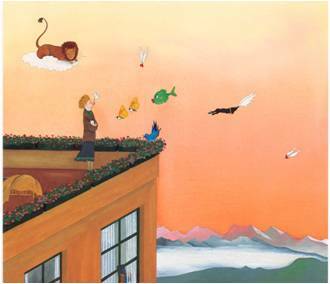 Mathers writes this story about a little girl, Rosa, who finds comfort in writing to and receiving letters from her mother who is also away for treatement – drawing pictures, writing short stories and above all sending kisses through the post. In the end, Rosa is reunited with her mother for Christmas! Lovely. The illustrations are also very sweet. Flat Stanley, Jeff Brown. Definitely a book for slightly older children (i.e. not a 2 year old! ), but did think that I should add it to the review. Not all my “readers” are 2 and only ever getting toddler books may be a bit boring. Flat Stanley is probably almost considered a classic. Many people remember it from their own childhood (and this is indeed how I came across it – a friend recommended it). Great little book for when your child starts reading on their own. Flat Stanley wakes up one day to the commotion made by his brother and finds, that he is, erm, flat! Oh dear. The family soon finds out that being flat has a lot of advantages and Flat Stanley goes on all sorts of flat adventures, including being posted through the mail. Imagine that! One day however, Stanley is fed up of being flat. His brother comes up with a great idea to fix things! A great read for new readers. The Post Office Book, Mail and How It Moves, Gail Gibbons.What a great book about how the post office and the post office system works! Unfortunately this is about the US Postal System and we live in the Uk (the cover kind of gives that away, but I wasn’t paying attention!). A bit disappointed at this, we still sat down to read it. Red Ted seemed to really enjoy the pictures, which surprised me and many pages were still relevant. So, not such a bad find afterall. If you live in the US, then this book is great! I like the illustrations of the book, all in red, white blue and light blue. The process is explained well. There are maps and trains and ships and of course lots of (US) post boxes. Oooh Flat Stanley has been a big favourite of ours, and I remember reading it when I was little too. Going to root it out again soon for the little miss. 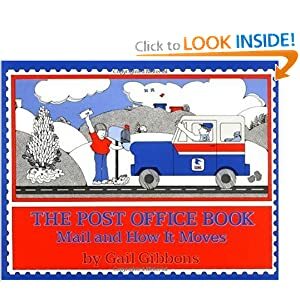 The post office book sounds really great, we love Gail Gibbons non-fiction books. The information is always relevant and the illustrations help keep my youngest child’s attention. We don’t live in the US either, but it sounds like it would be a nice read anyway. My older dd read Flat Stanley when she was little, thanks for the reminder..I will introduce him to my youngest dd! The first book you mentioned sounds lovely too. Not quite 1000 families… I think I’d still be off the blogosphere if that were the case! “only” 250+ families 😉 Lovely round up of books and so glad to see you as part of nonfiction monday! Love Gail Gibbons! And what a great idea to tie in books about how mail travels with the postcard swap. Thanks so much for sharing. Gail Gibbons is always a winner! We read Flat Stanely a couple of months ago, and my girls liked it fairly well but were not entraced by it.